Walking around San Joaquin Delta College campus, one can see many handicap accessible signs, walkways and paths. If one looks closer, however, it can be seen the campus is not as accessible as it seems. Multiple areas of the campus have very limited accessibility, such as the bathrooms. Many of the women’s bathrooms – such as the first floor of the Locke and Shima buildings – are hidden down corridors. While it is an easy 90-degree turn for most, simply using the restroom can be a hassle for persons with a disability. Attempting to maneuver a wheelchair through those corridors can be a huge problem for those who use one. Another problem is the elevators. The main concern is non-handicapped people using them. Roy Juarez, Student Program Specialist and Mobility Supervisor, said he has seen students who are not clearly handicapped entering before a handicapped student. Use of the elevators used to require a key, but in recent years they have been made accessible to all with priority going to Disablity Support Programs and Services students. ACCESSIBILITY: A DMV investigator, left, and a campus police officer, middle, check the handicapped placard of JoAnn Cataldo, a communication studies instructor, right, on April 24. Cataldo was legally parked in a handicap spot. Handicapped parking is another area with issues. Faculty member Deanna O’Dell, who uses a wheelchair, is unhappy with the disabled parking situation. She said she’s seen “young” people get out of cars with the blue handicap placards as if they had borrowed the vehicle or placard from a relative. “There had been days when I had to go home because there were no handicap spaces,” O’Dell said. Recently, however, campus police have been taking steps to deal with placard abuse. 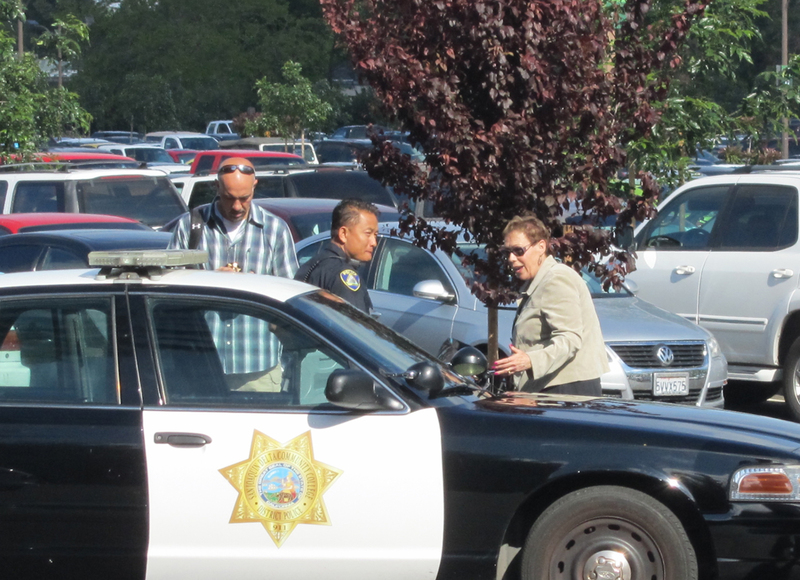 On April 24, campus police partnered with seven agents from the California Department of Motor Vehicles to run a thorough check of the parking lots. The officers and agents were verifying users of the handicap placards were also the registered owners of them as well. At least a dozen people abusing placards were found. Lisa Perez, a computer science teacher, said she’d like to see other aspects of Delta College changed. “The route to get from the Shima parking lot to my classroom on the fourth floor [of Cunningham] is a pain every day; I have to factor in at least an extra 10 minutes or more before class,” Perez said. Perez has serious problems with her knees and requires the use of a wheelchair. She also mentions the surface of the actual grounds in the quad as an impediment. 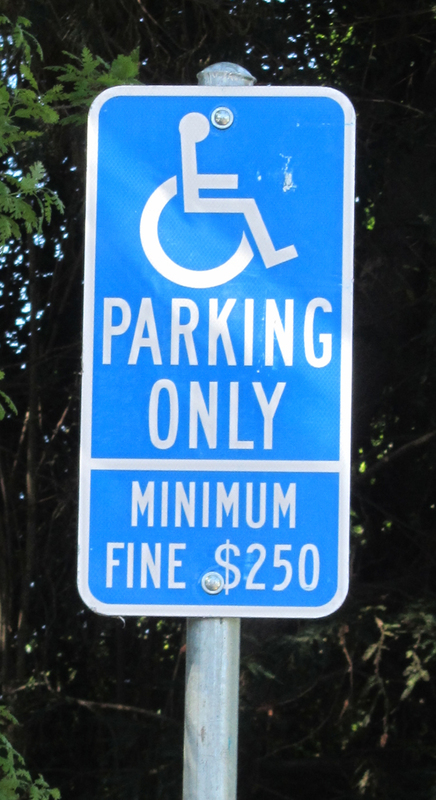 ACCESSIBILITY: A sign marking a handicapped parking spot lists the minimum fine for placard misuse. “The brick laid out in the quad is too bumpy and makes for uncomfortable wheelchair travel, and there is a slight grade by the koi fish pond,” she said. When Delta College was built in the early 1970s, it was twenty years removed from the 1990 Americans with Disabilities Act. The act increased accesibility for persons with disabilities. Danita Scott-Taylor, Director of Student Support Services, believes the issues definitely have to do with the age of the school. “Any campus built prior to the 90s probably has accessibility issues,” Scott-Taylor said.